Below are a number of relevant examples of publications describing the coverage of the work done in recent years in areas related to the utilization of geothermal energy. Scientific final report of the project “Geothermal pilot well, phase 1b”. The report is the result of work under Working Package 2 (WP2) and is financially supported by EUDP (Energy Technology Development and Demonstration Program) under the Danish Energy Agency. The main purpose of this report is to provide the best basis for a prediction of relevant reservoir parameters (depth, thickness, transmission capacity, production capacity, etc.) for the Upper Trias to Lower Jurassic Gassum Formation, as well as the overlying Lower Jurassic Karlebo unit in northern Copenhagen. The results obtained will form the geological basis for a decision on the location of an exploration well which will be drilled later. Describes the background of the WebGIS portal, as well as its content, functionality and perspectives. Best practice script on the establishment and operation of geothermal plants for the production of heat for district heating plants. Description of methods and tools that can be used as inspiration for the development and implementation of concrete projects. Describes the Danish guarantee scheme for geothermal energy for which funds have been allocated. Important paper that describes a method of comparing and quantifying geological data in order to assess the geothermal potential. An article describing a multidisciplinary study of a geothermal reservoir in the area below Thisted. 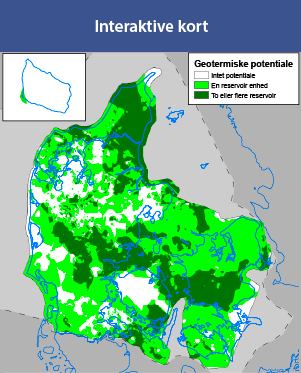 A short article describing the early geothermal exploration in Denmark as well as an overview of the Danish subsurface, potential geothermal reservoirs and important geological parameters related to geothermal energy. NOAH article that explains in a straightforward way geothermal energy and the perspectives of exploiting it in Denmark.